Quintero showed All-American type abilities in every freestyle race, from 50 to 1650 yards, and at the NCAA Championships he placed 3rd in the 100 free (42.14), 2nd in the 200 free (1:31.96, and was the National Champion in the 500 free (4:10.02). He’s the highest-returning finisher in all three events from NCAA’s, and will have a shot at winning three NCAA titles next season. And that next season is where the number-one story for USC for 2014-2015 begins. Late in the 2013-2014 season, after a picture of the USC “seniors” emerged that included Quintero, USC’s media relations staff confirmed that Quintero was only being given three years of eligibility by the NCAA. After the season ended, though, the Trojans quietly voted Quintero as a captain for the 2014-2015 season, and announced at their team banquet a few weeks ago that the NCAA granted Quintero a 4th year of eligibility upon further review. That will have an almost immeasurable impact on USC’s 2014-2015 season. The part that we can measure is the number of points that Quintero will be worth at NCAA’s, which has to be at least 80-90, including relays. That’s the difference between finishing in the top 15 at NCAA’s and fighting for a top 6 spot at NCAA’s. USC’s 800 free relay won their first NCAA title in that event since 2002 when Klete Keller was on the anchor, swimming a 6:13.09 – averaging a 1:33.2. 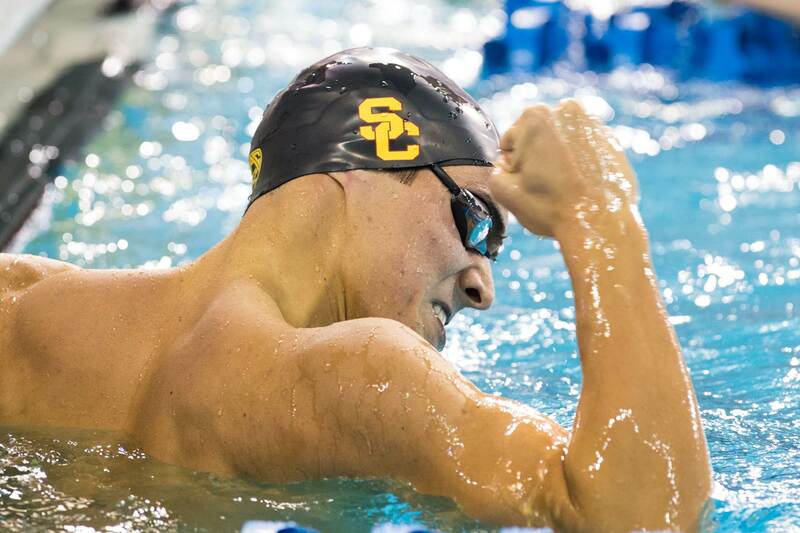 They graduated one swimmer, their anchor and fastest split Dimitri Colupaev, but the Trojans still have every optimism for repeating. That starts with Quintero, the best 200 freestyler in the country (which never hurts). It’s the middle two legs from last year’s team, though, who will hope to rise to the occasion in 2015: sophomore Reed Malone (1:34.32 split) and sophomore Dylan Carter (1:33.25 split). For Malone, that split was exactly where one would expect – half-a-second better than his best flat-start time in the event. The same goes for Carter, who was four-tenths better than his best flat start. The reason for expecting them to pick up a lot of Colupaev’s load next year has nothing to do with any disappointment last year – rather it’s more of a projection based on their summer success. Malone knocked three seconds off of his lifetime best in the 200 meter free – a year after a disappointing summer of 2013 where he didn’t even come close to a best time. 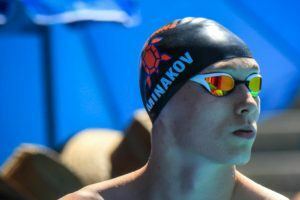 He also dropped three seconds off of his best time in the 400 free, which put him on to the United States’ Pan Pac Championship team – his first big senior qualification. There’s every reason to expect Malone to at least roll into a 1:33-high on a relay this season. Carter really seemed to spend the summer focusing on his speed, with the result being no best time in the 200 free in long course, but a 49.50 in the 100 free at the Commonwealth Games representing Trinidad & Tobago. When he puts that all back together at USC, with a full-season competing for the varsity squad, he should continue to drop time as well. Last year, USC had two of the three fastest 200 freestylers in the Pac-12, and four of the top 10. For this season, however, that still leaves a matter of who will take Colupaev’s spot on that relay. Luckily, the Trojans have depth. The next two in line among returnees are senior Chad Bobrosky, who was a 1:35.18 last year, and sophomore Michael Domagala, who was a 1:35.10 last season. There’s some solid freshmen 200 freestylers in the class (Jason O’Brien, 1:38.49, for example), but none that on paper should fight those two for the spot. If either Bobrosky or Domagala splits 1:33 on the relay, USC will be hard to beat. Last year’s NCAA runners-up Florida graduated half of their relay, the 4th-place finishers Michigan did the same. Stanford, who was 3rd but two-and-a-half seconds behind USC, will be the biggest challengers, with all four legs returning. Texas and Cal have very good relays as well, and Michigan and Florida will reload as they always do (Michigan had the best swim in the country last year by over three seconds, just not at the right meet). But with all of that considered, USC’s relay still looks in very good shape. Domagala went best times in the 100 fly (46.65), 200 fly (1:45.05), and the 200 free (dropped three tenths) as a freshman, but in both cases his bests came mid-season. Steven Stumph didn’t go best times in anything in the 2013-2014 season in yards or meters. He came close in the IM races, but his best yards swims in his best events are all still from his senior year of high school. Santo Condorelli actually wound up with a pretty good season in terms of raw times, going a 19.68 in the 50 free and a 43.35 in the 100 free, but again, both came mid-season at the Texas Invite. Condorelli spent much of the summer training with former USC Trojan sprint superstar Vlad Morozov in Russia, though that didn’t pay off at the end of the summer. He’s got some good things to build off of though, with some good relay splits at NCAA’s that should help cover for Colupaev’s loss. That includes a 43.17 on a rolling start in the 400 free relay, and a 19.07 (with a -.13 reaction time that led to their DQ) on the 200 free relay. Even accounting for his advantage on the exchange, that’s a good split. David Morgan did hit his best times at his year-end taper meet, the Pac-12 Championships, with a 20.15 in the 50 free, 44.27 in the 100 free, and 54.28 in the 100 breast. That still wasn’t quite enough to get him to NCAA’s. The big hit last year was Israeli backstroker Yakov Toumarkin, who never wound up racing for the Trojans and isn’t on their roster anymore. For those who are left, though, USC just needs them to hit their best swims at the end of the year, like Morgan did, and make that end-of-year meet NCAA’s. Their free relays will need Morgan and Condorelli to be good, and the long-term health of their medley relays will depend on continued development of Stumph and Domagala. We couldn’t go much further without mentioning USC’s top sprint butterflier Maclin Davis. He was 17th at NCAA’s last year in the 100 fly, 6th-fastest nationally among the sophomore class, and with half of the 16 swimmers ahead of him now graduated, he’s in sure-fire position to score individually at NCAA’s. As a freshman, the former National High School Record holder qualified for NCAA’s individually in just the 100 fly, his best event, but didn’t swim very well at that meet. As a sophomore, he added qualifications in the 50 and 100 freestyles, and just about matched his season-best times. Does two years make a trend? Not in any statistical sense, but it seems as though Davis is getting more-and-more comfortable at the national championships and developing into a better-and-better overall swimmer. His junior year could finally be his big breakthrough year. With Chase Bloch gone, there’s a touch more pressure on Davis to carry that sprint butterfly load. He and Domagala are about what USC has there. USC’s men’s side doesn’t have much of a big-name breaststroker on campus, despite head coach Dave Salo’s reputation with them. Stumph could have been that guy, but as discussed above, didn’t pan out that way in his freshman year. Still, USC has a lot of very good breaststrokers last year who are all in the hunt for dipping into the 52’s in the 2014-2015 season. Then-junior Sergio Lujan-Rivera wound up getting the nod on the medley relays at NCAA’s, and that was probably the right choice (he split 52.75 and 24.46). Next year, the decision will get even more muddled. Andrew Malone, who is also entering his senior year, had a big breakout at Pac-12’s to qualify for NCAA’s individually as well (53.22 in the 100 breast on a flat-start). That actually made him the fastest USC Trojan in the event last season, despite the relay decision, but his taper was for Pac-12’s – and he added significant time at NCAA’s. He’ll have a chance to build off of his success last year and focus his taper for NCAA’s, which gives him a chance at taking those relay spots from Lujan-Rivera. USC will also have junior Morten Klarskov. In 2013, at the end of his freshman year, he finished 11th at NCAA’s in the 100 breast and 12th in the 200 (though Lujan-Rivera still got the relay spots). Of the three, though, he does have the best flat-start time in the 100. A dream scenario would see all three qualify for NCAA’s individually without burning their full tapers, and give Dave Salo an almost can’t-miss, but still challenging, decision for his medleys after watching them train up until the meet. USC’s biggest trio of signees came very late – they weren’t announced until June. But, as they say, it’s never late than better. Ralf Tribuntsov, an Estonian, is a 23.40/49.88 long course freestyler; 24.88/53.79 long course butterflier; and 25.74/55.26 long course backstroker. In the long-term, he’s going to be a big contributor if he develops. The biggest question is how quickly he’ll adapt to yards – always the question with internationals. He could be a big help on USC’s 200 medley relay year one, however. Pawel Furtek will be another addition to the USC distance group, with long course bests of 3:52.4 in the 400 free and 7:57.9 in the 800 free. And Jon Knox comes in with yards bests of 20.8 in the 50 free and 1:37.0 in the 200 free, and is an above-average backstroker as well. They join the aforementioned O’Brien in the USC freshman class that will add more depth to this team, and maybe with less hype will come along at a more natural progression for the Trojans. Luca Spinazzola had some out-of-the-pool issues last year that cost him some meets, but despite he showed up big at NCAA’s and didn’t seem distracted at all. He was only 6th in the 100 back in Austin, but his 45.13 in prelims was the 4th-best time in the country, and behind only Ryan Murphy within the Pac-12. He’s also very good in the 50, and he and Davis in combination should make USC better than the 14th-place they wound up in the 200 medley relay. Distance swimmer Ted Singley progressed to an NCAA qualifier as a sophomore last season. He improved about a second in his 500, but dropped 7 in his 1650 last season. It will take about another 7 second drop for him to score at NCAA’s, but he’s a big point contributor at the Pac 12 Championships. Senior Cary Wright is another very good distance swimmer, but he’s a little more versatile than Singley. Wright finished 19th at NCAA’s in the 200 fly, and one spot behind Singley (27th) in the mile. Chad Bobrosky had a tough junior season for USC, and missed qualifying for NCAA’s after scoring individually as a freshman in the 500 free, and scoring on a relay as a sophomore. The one silver-lining for him was that he found some speed – he went a lifetime best of 44.26 in the 100 free. 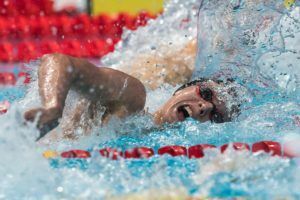 Those sprinting abilities showed up again over the summer back home in Canada – he went lifetime bests in the 50 SCM free (23.28), the 100 SCM free (49.72), and the 50 SCM back (26.60). He was pretty light, overall, on long course racing in the summer, having taken a big chunk of time off after Pac-12’s. He had some non-descript health issues last year, but if he’s refreshed, he could be up for taking Colupaev’s spot in the 800 free relay. Dakota Hodgson was also battling some health issues last year. USC’s men’s diving program hasn’t had as much success as their women, but there’s still some quality there that will contribute mostly at Pac-12’s. But they do have a talented bunch, including two key transfers. Collin Pollard was their highest performer at Pac-12’s last year after transferring from Cal. He just barely missed qualifying for NCAA’s, as did his teammate Jordan Gear. In fact, they were the next two in line for qualification out of Zone E – Gear from his performance on the 3-meter, and Pollard from his performance on the 1-meter. They’re joined by another transfer this year, Deon Reid, who comes back to his native California after two years at Duke. Reid was a Zone B finalist last year, and dives the 1-meter, 3-meter, and platform events. They also brought in freshman Dashiell Enos, who represented the USA at the Youth Olympic Games last year. USC is a very deep team. They qualified 9 individual swimmers for NCAA’s last year, though most of the individual scoring came from Quintero. Not DQ’ing the 200 free relay would’ve made them closer to number 7 Arizona, but probably wouldn’t have passed them, and it would’ve still been a long climb (48 points) to number 6 Auburn. If everyone is healthy and happy, and they can get some diving points USC has the depth of talent to finish as high as 5th at NCAA’s. A more significant goal would be the possibility of jumping Stanford for the #2 spot in the Pac-12. After so many years with the Cardinal at the top of that pile, it would be a significant shift for USC to out-place them. Both teams have had trouble getting all of their swimmers on-target in the same season, and USC is a deeper team this year than Stanford. There was just a 40-point gap between the two teams last year, and on early projections we’d pick USC to place ahead of Stanford at the conference meet. All-in-all, this will probably be a very similar season to last year at NCAA’s, with another 7th-8th place finish. The Trojans will be riding high on the possibility of Quintero’s triple-title run, and if they get that momentum rolling, the proverbial sky is the limit. I’m excited to watch Quintero and Malone, Malone is set up to do amazing this year and I do not think he will disappoint. As a team, they look very similar to last year in terms of NCAA predictions. Quintero cannot carry the team, so it’s up to Bobrosky, Carter, and Malone to help him out if they want to get better than 9th. USC has the potential to be very good. Quitero with the triple win, Malone 1:32 and 4:12, Condorelli 19 low and 42, a plethora of breaststrokers, Davis splitting 45, and Carter, Spinnazola, Domagala, Bobrosky providing depth. The question is if all of this can come together at NCAAs. I certainly hope so. Why was there any question about Quintero getting a 4th year? The NCAA’s change of ruling was a result of what? Just curious. longseeker – nobody official is saying anything. Usually in these situations, it has to do with having begun college somewhere internationally, thus kicking off your eligibility clock, but again, that’s a broad statement that we’ve been unable to verify if it applies to Quintero’s case.